I wish I had educated myself more before my first daughter was born. I can never undo my choices, and I will forever worry about the unnecessary danger I put her in, all the chemical exposure, the potentially life-threatening risks I put her through. Seat belts are “made of synthetic fibers such as nylon, polypropylene or polyester.” Synthetic fibers. Why would I expose my daughters to synthetic material when I’m trying to keep them as natural as possible? 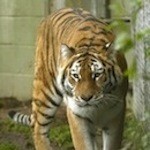 Nylon, for example, is made out of “synthetic polymers known generically as aliphatic polyamides.” Aliphatic polyamides! A quick Google search found a link between that word, “aliphatic,” and brain cancer. BRAIN CANCER. Polypropylenes have been linked to colorectal cancer: “early epidemiological studies of polypropylene production workers and carpet manufacturing employees who use polypropylene reported a significant excess of colorectal cancer.“ And this link tells me that polyester is “the worst fabric you can wear,” in a list of TOXIC FABRICS. And I’m supposed to put this up against my NEWBORN BABY’S SKIN? No way. You don’t see a lot about this in the news, but there’s a reason for that, and that reason is Big Business. Do a Google search and you will soon find millions of articles about seat belt injuries. Nobody denies that they happen. “The increase in road traffic accidents and the seat belt compliance rate contribute to higher rates of injuries resulting from seat belt use.” Right there on the page — more seat belt compliance leads to more injuries. This is a big one, so I’m going to have to break it down. a) Kids with autism have overwhelmingly spent time in car seats. Every single child I know who has autism spent time in car seats, most of them for many hours EVERY WEEK. Think about how many hours of toxic chemicals that adds up to by the time the child is 18 months old, when signs of autism first tend to show up. b) Car seats trigger autism in otherwise healthy children. A friend of mine turned her son’s car seat around, no doubt releasing dangerous chemicals in the air, and later that day noticed signs of autism. Before she turned the seat around, he was completely normal. Her son got diagnosed within a few months. If only she had never agitated those chemicals, or better yet, never let her son sit in a car seat at all, he could have lived a neurotypical life. c) The Amish don’t use car seats and don’t have Autism. d) As seat belt usage has increased, so has autism. 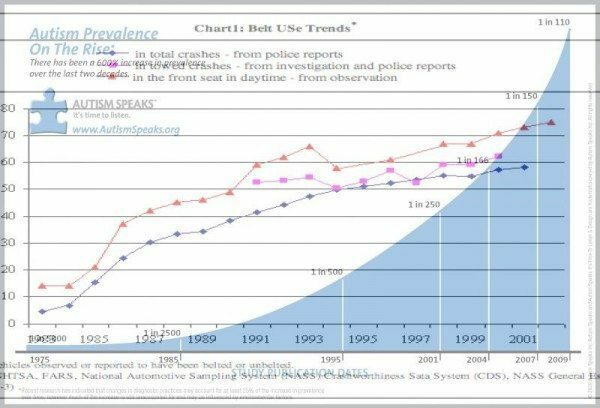 The prevalence of seatbelt usage from the 1980s to today (Source: NHTSA). 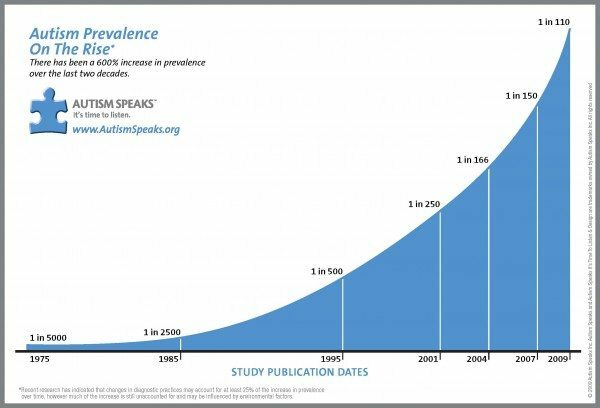 Autism has gone up as seat belt usage has gone up (Source: Autism Speaks). As the rate of seat belt usage has gone up, so has the rate of autism. When you look at the superimposed graphs together, you can see that both started at the same point in the early 1980s, and jumped to the same point by now. The population got fed the KoolAid about seat belts, started putting those chemicals on our babies’ skins, and now we are riddled with autism. Thanks, government regulations. The people who tell me that I “must” use a car seat for my baby tell me that she will DIE if I don’t use them. This is a deliberate attempt to scare me into doing something unhealthy and frightening for my child, and I will not be a Sheeple and follow this fearmongering blindly. The threats of car crashes are way overblown. In 2012, there were 25,580 fatalities. This is out of a population of 320 million. You do the math. In 2012, 122 people died while using seat belts. If seat belts are so great, why are people dying while using them? 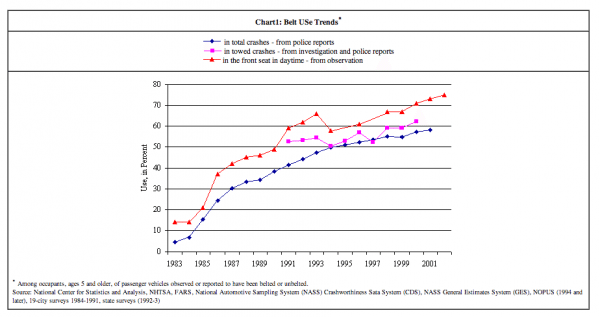 The fact of the matter is that fatalities from car crashes were going down before seat belts even arrived on the scene. Things like windshields, brakes, and dashboards, to name a few. 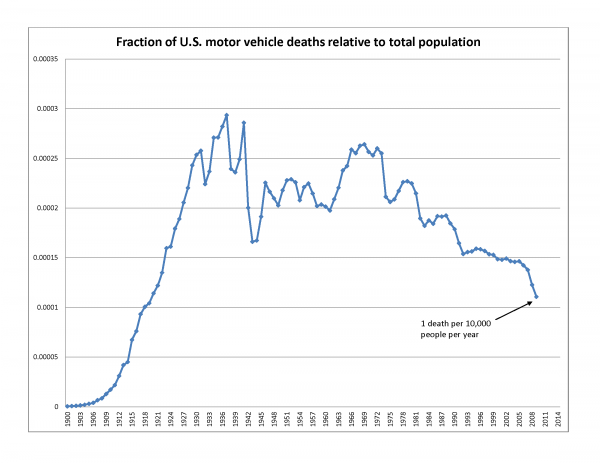 The rate of car crashes were going down before seat belts were introduced, then went back up with the introduction of seat belts (Source: Wikipedia). The seat belt wasn’t invented until 1958, after fatalities had already been decreasing for decades (notice that fatalities went up after the introduction of seat belts). Safety has been increasing over time, and seat belts just got in the way of that. That which doesn’t kill us makes us stronger. How are my children’s bodies going to learn to be flexible, to heal, to become strong if there is no exposure to the occasional bump and bruise? Why the push from the government for everybody to use car seats and use seat belts? It’s obvious. With 4 million babies born in the U.S. annually, and each requiring three child restraint seats before age eight, Americans buy as many as 12 million seats a year. Twelve million seats each year. And don’t forget, you aren’t supposed to buy used seats, and the average cost of an infant seat is $100 or more. Big Business is keeping us buying these completely unnatural, highly toxic, ineffective and unnecessary items, and Big Government is forcing it down our throats. I know my choices may not be popular, but here’s the thing: choosing not to use a car seat (or any restraint) affects nobody except me and my own children. If I want to use shoddy internet research and bias-confirmation searches to make my own choices, I face my own consequences. This is in stark contrast to the exact same types of “research” which are used to justify the anti-vaccination movement, which puts everybody at risk. If you think my methods are terrible, which they are, apply them to the anti-vax movement. And get angry that these same sloppy reasons are being used to justify a resurgence of measles, of whooping cough, of diseases which were supposed to be eradicated. Through a fundamental misunderstanding of the difference between causation and correlation, confusion between anecdotal evidence and scientific evidence, and an inability to wade through all the crap there is out there on the internet to find out what is scientifically sound, people who choose not to vaccinate put us all at risk, the weakest among us at the most risk of all. All one has to do is decide on a hypothesis, and Google will provide “evidence” to support it. That doesn’t make it real.